To Cite: Lu C, Cui Z , Qi X , Pant O P, Lu C, et al. In Vivo Confocal Microscopic Analysis of Keratitis Induced by Anaphylaxis to Intravenous Metronidazole: A Case Report and Literature Review, Iran Red Crescent Med J. Online ahead of Print ; 21(1):e84698. doi: 10.5812/ircmj.84698. Introduction: Keratitis induced by type I hypersensitivity to metronidazole is rarely reported. In vivo confocal microscopy (IVCM) is a promising method for the investigation of corneal morphology under pathological conditions. The purpose of the present study was to investigate the IVCM features of keratitis associated with anaphylaxis to metronidazole and review the literature regarding IVCM application to study drug-related changes in the cornea. Case Presentation: A 50-year-old woman with acute bilateral keratitis induced by anaphylaxis to intravenous metronidazole presented to the Department of Ophthalmology, the first affiliated hospital of Jilin University, Changchun, China in Jan 2018. She initially experienced photophobia, moderate conjunctival injection, and watery discharge after infusion of intravenous metronidazole. These symptoms gradually resolved one month after she was administered anti-allergic drugs. Corneal morphology related to anaphylaxis to metronidazole was investigated by IVCM before and after treatment. To our knowledge, this is the first reported case of IVCM images of keratitis associated with anaphylaxis to metronidazole. Conclusions: In vivo confocal microscopy can allow objective evaluation of treatment response through cellular changes in the cornea and could provide good-quantity images of ocular surface tissues for follow-up. Both systemic and topical drugs can cause adverse vision-threatening reactions. These reactions can range from dry eye syndrome, keratitis, glaucoma, corneal ulcers and cataract to severe vision loss complications of toxic retinopathy and optic neuropathy (1, 2). Previous studies demonstrated that topical drugs including topical anesthetics (2) and topical tetracaine abuse (3) as well as systemic agents including tamsulosin (4), erectile dysfunction agents (5), antiepileptics (6), chemotherapy agents (7), corticosteroids (8), phenothiazines and antimalarial drugs (9) can cause ocular toxicity. Metronidazole, with its anti-anaerobic properties, is one of the widely used antibiotics in the medical practice. Occasionally, allergic or toxic reactions to this medication may occur, the common side effects of which include nausea, a metallic taste, loss of appetite, headaches and diarrhea (10). However, keratitis associated with anaphylaxis to intravenous metronidazole has not been reported. This report describes the case of a 50-year-old woman with metronidazole-induced keratitis who was treated using topical steroids. Corneal morphology before and after treatment was observed using in vivo confocal microscopy (IVCM). We also reviewed the role of IVCM in drug-related corneal changes published to date. This is the first reported case of metronidazole-induced keratitis. A 50-year-old woman was referred to the Department of Ophthalmology, the first affiliated hospital of Jilin University, Changchun, China with a 1-day history of eye-related symptoms induced by anaphylaxis to intravenous metronidazole in Jan 2018. Before coming to our hospital, she was treated with antibiotics and analgesics for toe infection at a local hospital. After treatment with metronidazole, she experienced photophobia, moderate conjunctival injection, watery discharge, painful foreign body sensation, and oral ulcers. However, there was no hypotension or angioedema, and her serum creatinine and albumin levels were within normal ranges. Hence, the clinical diagnosis of type I allergy was made at the same hospital. Metronidazole was discontinued and the patient was treated with intramuscular adrenaline, intravenous diphenhydramine, dexamethasone and 1 L of 0.9% NaCl bolus. Because of lack of equipment, the patient was referred to our tertiary center for further evaluations. There was no past history of drug-related allergic reactions and other systemic or ocular diseases. On examination, the best-corrected visual acuity was 20/40 in both eyes based on Snellen chart. Slit-lamp examination (performed using an SL 130 Slit Lamp; Carl Zeiss, Oberkochen, Germany) showed bilateral conjunctival injection, as well as, dense and small corneal infiltrates in the corneal epithelium (Figure 1A and B). Other ocular examinations were unremarkable. Corneal contact IVCM using ConfoScan 4 confocal microscope equipped with a Z-ring adapter (Nidek, Inc., Fremont, CA) was performed under topical anesthesia. On IVCM, significantly increased hyper-reflective dots were observed extending from superficial epithelium to the anterior stroma (Figure 2A). We also found an increased density of the ‘wire netting’ pattern of Langerhans’ cells (LCs) presented as large cells bearing long processes between the level of basal epithelium and the nerve fibers beneath the basal epithelial cells (Figure 2B), and activated keratocytes were detected in the superficial stroma (Figure 2C). The patient received topical loteprednol etabonate and lubricant eye drops three times daily for a month. At weeks one and two of topical treatment, IVCM showed a reduction in the density of both dots (Figure 2D and G) and the LCs presented as small cells bearing short or no processes (Figure 2E and H). At the same time, the activated keratocytes in superficial stroma had gradually recovered (Figure 2F and I). Figure 1. Slit-lamp image of the right (A) and left eyes (B) before topical treatment showing multiple small corneal infiltrates scattered throughout the cornea. Also, (C) and (D) of right eye and left eye, respectively, after treatment at one-month follow-up revealing resolved bilateral small corneal infiltrates in the corneal epithelium. Figure 2. In vivo confocal microscopy images (IVCM) of the left eye. Before treatment, IVCM shows increased density of hyper-reflective dots (2A, arrows) and ‘wire netting’ pattern of Langerhans’ cells (LCs) (2B, arrows); keratocytes activation was detected in the superficial stroma (2C, arrows). At one week of topical treatment, the density of both dots (2D, arrows) and LCs decreased (2E, arrows); the activated keratocytes in superficial stroma recovered gradually (2F, arrows). At two weeks of treatment, the dots almost disappeared (2G, arrow), the LCs significantly decreased (2H) and the keratocytes in stroma returned to normal (2I). The topical steroid dosage was tapered over time. At one-month follow-up, the symptoms had resolved with visual acuity improvement to 20/20 in both eyes. Slit-lamp examination showed that bilateral small corneal infiltrates in the corneal epithelium had resolved (Figure 1C and D); all those changes detected by IVCM had also resolved. The worldwide use of antibiotics is growing, and thus, the potential for adverse drug reactions is substantial. Metronidazole is a 5-nitroimidazole antibiotic widely used against anaerobic and parasitic infections due to its efficacy and safety (11). Besides beneficial effects, metronidazole can produce a systemic allergic response and multiple organ systems can be affected, including the digestive system, the respiratory system and the circulatory system (12, 13). Less commonly, it can affect the central nervous system leading to cerebellar toxicity and metronidazole-induced encephalopathy (MIE) (14, 15). Depending on the rate of severity, it can cause cutaneous reactions, bronchoconstriction, edema, hypotension, coma, and even death. Occasionally, allergic reactions of the mouth may manifest as erosions, but such reactions as keratitis have never been reported. Common symptoms of ocular allergies include redness and itching of the conjunctiva and watery discharge. IVCM is a promising non-invasive method to investigate the morphology of cornea under both normal and pathological conditions by providing good-quality images of ocular surface tissues. IVCM has been used to study ocular surface changes in various clinical settings (16, 17). Through the review of published literature, the role of IVCM in studying drug-related corneal changes is summarized in Table 1. However, no studies have yet investigated corneal morphology related to anaphylaxis to metronidazole before and after treatment. In our case, the patient experienced photophobia, moderate conjunctival injection, watery discharge, painful foreign body sensation and oral ulcers after the administration of intravenous metronidazole. IVCM revealed significantly increased hyper-reflective dots extending from superficial epithelium to the anterior stroma. The dots, which are supposed to be related to antigen-antibody complexes, resolved after one month of topical steroids. The mechanisms involved in the clearance of corneal immune deposits are not clear. A study by Maria suggested that stromal keratocytes may play an important role in the degradation of corneal immune deposits in the rabbit cornea (18). Our findings confirmed that keratocyte activation increases significantly following anaphylaxis to metronidazole. The level of activation then decreases over time, but it is unknown whether activated keratocytes can completely return to their original state or whether they permanently remain biochemically altered (19). Keratocytes seem to play an active role in the clearance of the immune complexes (18). Langerhans’ cells (LCs) show extraordinary immune-stimulatory capacity and play a key role in immune-mediated disorders because these cells are not only the “sentinels” of the immune system for the detection of foreign antigens, but they also play a critical role in tolerance induction to both self- and foreign antigens (20). We further described characteristics of LCs in this pathological condition, which were consistent with the previous studies that reported the location of LCs at the level of basal epithelium or between the nerve fibers beneath the basal epithelial cells in patients with vernal keratoconjunctivitis (21, 22). Epithelial LCs are believed to participate in cell-mediated immunity in inflammatory conditions (23). We observed an expected increase in the density of LCs after anaphylaxis to metronidazole, followed by a substantial decrease after one week, which resolved until one month after treatment with topical corticosteroid eye drops. Moreover, these LCs detected by IVCM were big in size with long dendritic processes at an early stage, which may reflect the maturity of LCs. The size of these LCs was decreased with short dendritic processes after topical steroids treatment for one week, and they disappeared after one month of treatment. By using IVCM, Zhivov et al. discovered that LCs in normal human eyes presented as either large cells bearing long processes or smaller cells lacking cell dendrites, presumably indicating mature and immature phenotypes, respectively (21). It has been known that LCs can be recruited into the cornea by appropriate inflammatory or immunogenic stimuli (20). The greater density of LCs in patients with anaphylaxis to metronidazole may be secondary to cell migration into the cornea from the limbus stimulated by immunogenic stimuli that might benefit from more aggressive corticosteroid treatments. In sum, drug-related keratitis should be considered in patients with ocular allergic symptoms and those receiving intravenous metronidazole. Ocular examination and IVCM should be performed for the definitive diagnosis and evaluation of corneal changes before and after treatment. Additionally, IVCM can allow objective evaluation of treatment response via cellular changes in the cornea. However, further studies are needed to define the pathogenesis of this unusual event. Ethical Considerations: The study followed the tenets of the Declaration of Helsinki, and informed consent was obtained from the patient. Funding/Support: This research received no specific grants from any funding agencies in public, commercial or not-for-profit sectors. Patient Consent: Written informed consent was obtained from the patient for the publication of this case report and any accompanying images. 1. Blomquist PH. Ocular complications of systemic medications. Am J Med Sci. 2011;342(1):62-9. doi: 10.1097/MAJ.0b013e3181f06b21. [PubMed: 21139494]. 2. Mergen B, Ozdamar A, Sarici AM. 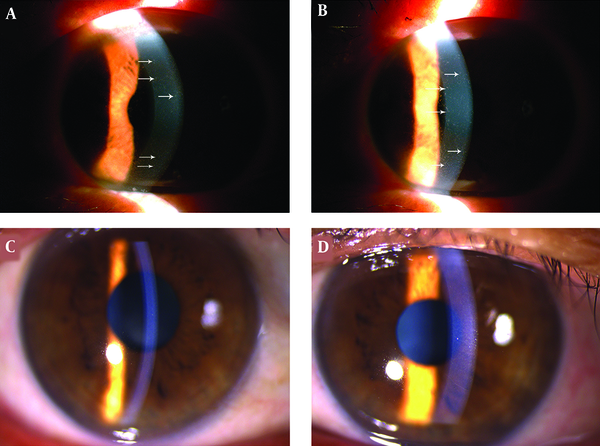 Ring keratitis from topical anesthetic abuse after laser epithelial keratomileusis. Eye Contact Lens. 2018;44 Suppl 1:S365-7. doi: 10.1097/ICL.0000000000000433. [PubMed: 28945650]. 3. Sedaghat MR, Sagheb Hosseinpoor S, Abrishami M. Neurotrophic corneal ulcer after topical tetracaine abuse: Management guidelines. Iran Red Crescent Med J. 2011;13(1):55-7. [PubMed: 22946020]. [PubMed Central: PMC3407587]. 4. Silverstein SM, Rana VK, Stephens R, Segars L, Pankratz J, Rana S, et al. Effect of phenylephrine 1.0%-ketorolac 0.3% injection on tamsulosin-associated intraoperative floppy-iris syndrome. J Cataract Refract Surg. 2018;44(9):1103-8. doi: 10.1016/j.jcrs.2018.05.029. [PubMed: 30078537]. 5. Neufeld A, Warner J. Case of bilateral sequential nonarteritic ischemic optic neuropathy after rechallenge with sildenafil. J Neuroophthalmol. 2018;38(1):123-4. doi: 10.1097/WNO.0000000000000615. [PubMed: 29215388]. 6. Mahendradas P, Parab S, Sasikumar R, Kawali A, Shetty BK. Topiramate-induced acute angle closure with severe panuveitis: A challenging case report. Indian J Ophthalmol. 2018;66(9):1342-4. doi: 10.4103/ijo.IJO_1192_17. [PubMed: 30127167]. [PubMed Central: PMC6113830]. 7. Schmid KE, Kornek GV, Scheithauer W, Binder S. Update on ocular complications of systemic cancer chemotherapy. Surv Ophthalmol. 2006;51(1):19-40. doi: 10.1016/j.survophthal.2005.11.001. [PubMed: 16414359]. 8. Al Hanaineh AT, Hassanein DH, Abdelbaky SH, El Zawahry OM. Steroid-induced ocular hypertension in the pediatric age group. Eur J Ophthalmol. 2018;28(4):372-7. doi: 10.1177/1120672118757434. [PubMed: 29554813]. 9. Yusuf IH, Sharma S, Luqmani R, Downes SM. Hydroxychloroquine retinopathy. Eye (Lond). 2017;31(6):828-45. doi: 10.1038/eye.2016.298. [PubMed: 28282061]. [PubMed Central: PMC5518824]. 10. VanCleave HZ, Sanchez AC, Lieberman JA, Ellenburg JT, Mabry WA. Probable metronidazole induced serum sickness-like reaction in a paediatric patient. J Clin Pharm Ther. 2016;41(6):736-8. doi: 10.1111/jcpt.12448. [PubMed: 27663456]. 11. Lofmark S, Edlund C, Nord CE. Metronidazole is still the drug of choice for treatment of anaerobic infections. Clin Infect Dis. 2010;50 Suppl 1:S16-23. doi: 10.1086/647939. [PubMed: 20067388]. 12. Tang AW. A practical guide to anaphylaxis. Am Fam Physician. 2003;68(7):1325-32. [PubMed: 14567487]. 13. Kancherla D, Gajendran M, Vallabhaneni P, Vipperla K. Metronidazole induced liver injury: A rare immune mediated drug reaction. Case Rep Gastrointest Med. 2013;2013:568193. doi: 10.1155/2013/568193. [PubMed: 24455335]. [PubMed Central: PMC3884854]. 14. Patel K, Green-Hopkins I, Lu S, Tunkel AR. Cerebellar ataxia following prolonged use of metronidazole: Case report and literature review. Int J Infect Dis. 2008;12(6):e111-4. doi: 10.1016/j.ijid.2008.03.006. [PubMed: 18511323]. 15. Sorensen CG, Karlsson WK, Amin FM, Lindelof M. Metronidazole-induced encephalopathy: A systematic review. J Neurol. 2018. doi: 10.1007/s00415-018-9147-6. [PubMed: 30536109]. 16. Fogagnolo P, Sacchi M, Ceresara G, Paderni R, Lapadula P, Orzalesi N, et al. The effects of topical coenzyme Q10 and vitamin E D-alpha-tocopheryl polyethylene glycol 1000 succinate after cataract surgery: A clinical and in vivo confocal study. Ophthalmologica. 2013;229(1):26-31. doi: 10.1159/000342196. [PubMed: 23011409]. 17. Fogagnolo P, Dipinto A, Vanzulli E, Maggiolo E, De Cilla S, Autelitano A, et al. A 1-year randomized study of the clinical and confocal effects of tafluprost and latanoprost in newly diagnosed glaucoma patients. Adv Ther. 2015;32(4):356-69. doi: 10.1007/s12325-015-0205-5. [PubMed: 25893514]. [PubMed Central: PMC4415941]. 18. Suttorp-Schulten MS, Nunes-Cardozo B, Breebaart AC, Kijlstra A. The fate of antigen-antibody complexes in the rabbit cornea. Curr Eye Res. 1991;10(8):773-8. doi: 10.3109/02713689109013871. [PubMed: 1914509]. 19. Fini ME. Keratocyte and fibroblast phenotypes in the repairing cornea. Prog Retin Eye Res. 1999;18(4):529-51. doi: 10.1016/S1350-9462(98)00033-0. [PubMed: 10217482]. 20. Dana MR. Corneal antigen-presenting cells: diversity, plasticity, and disguise: The Cogan lecture. Invest Ophthalmol Vis Sci. 2004;45(3):722-7. 721. [PubMed: 14985280]. 21. 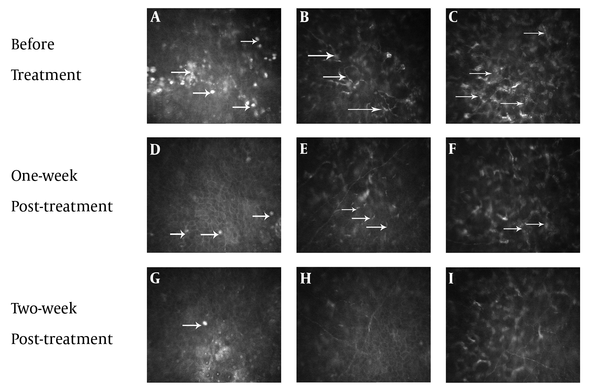 Zhivov A, Stave J, Vollmar B, Guthoff R. In vivo confocal microscopic evaluation of Langerhans cell density and distribution in the normal human corneal epithelium. Graefes Arch Clin Exp Ophthalmol. 2005;243(10):1056-61. doi: 10.1007/s00417-004-1075-8. [PubMed: 15856272]. 22. Liu M, Gao H, Wang T, Wang S, Li S, Shi W. An essential role for dendritic cells in vernal keratoconjunctivitis: Analysis by laser scanning confocal microscopy. Clin Exp Allergy. 2014;44(3):362-70. doi: 10.1111/cea.12264. [PubMed: 24372712]. 23. Mastropasqua L, Nubile M, Lanzini M, Carpineto P, Ciancaglini M, Pannellini T, et al. Epithelial dendritic cell distribution in normal and inflamed human cornea: In vivo confocal microscopy study. Am J Ophthalmol. 2006;142(5):736-44. doi: 10.1016/j.ajo.2006.06.057. [PubMed: 17056357].